Citation Information: J Clin Invest. 2016;126(8):2795-2798. https://doi.org/10.1172/JCI88959. All CARs contain an extracellular antigen-binding domain derived from an scFv that is composed of both the heavy and light chains of a TAA-targeting monoclonal antibody and an intracellular-signaling domain that is usually derived from the TCR CD3ζ chain to activate T cells. Only the CD3ζ signaling domain is present in first-generation CARs. 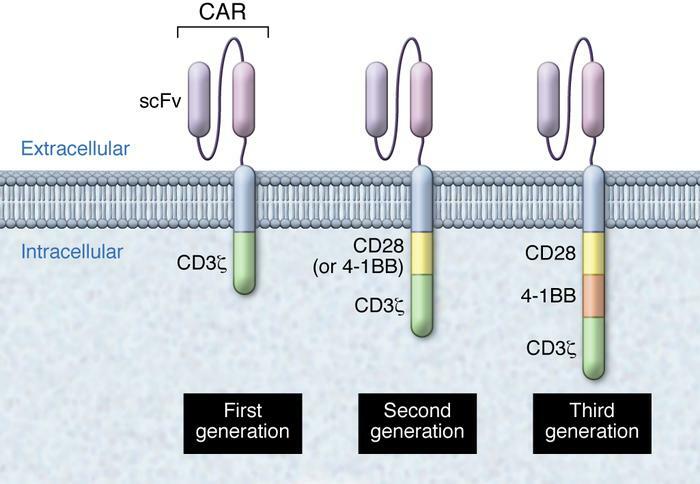 For second-generation CARs, one additional costimulatory domain, such as CD28 or 4-1BB, is added, while third-generation CARs contain two costimulatory domains.